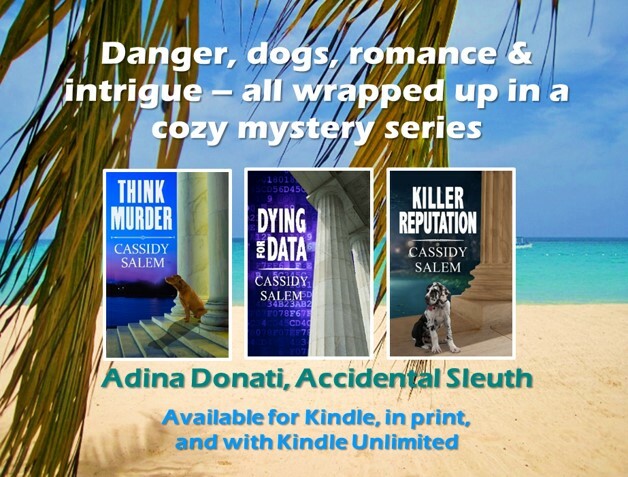 As part of a Blog Tour organized by Great Escapes Free Virtual Book Tours, I recently had the pleasure of reading One Dead, Two to Go, the first book in a new cozy mystery series. First of all, I loved the main character’s name (and its origins) and enjoyed learning about her personal journey. As Eddie tells her story, she shares her feelings and thought processes with the reader in a candid way – no holds barred. She is for the most part level-headed, although her quirky mother’s arrival on the scene does lead her into making some not-so-smart decisions. And the dynamic between the two women evolved as they spent time together and Eddie learns more about her past. The mystery itself kept me wondering what was really going on and the plot took several turns before coming to a satisfying resolution. An occasional touch of silliness and humor make this an enjoyable light mystery and a great start to a new series. Click here to enter a Rafflecopter giveaway for the chance to win one of seven print copies of One Dead, Two to Go.